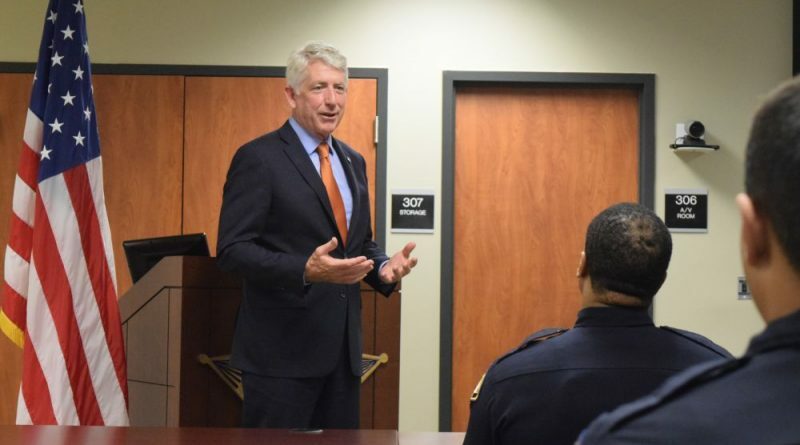 Attorney General Mark R. Herring visited the Loudoun County Sheriff’s Office on Monday morning to unveil a law enforcement training video he hopes will save lives across the commonwealth. The video provides information on opiate addition, how to recognize the signs of overdoses, and how to respond to the life-threatening situations. 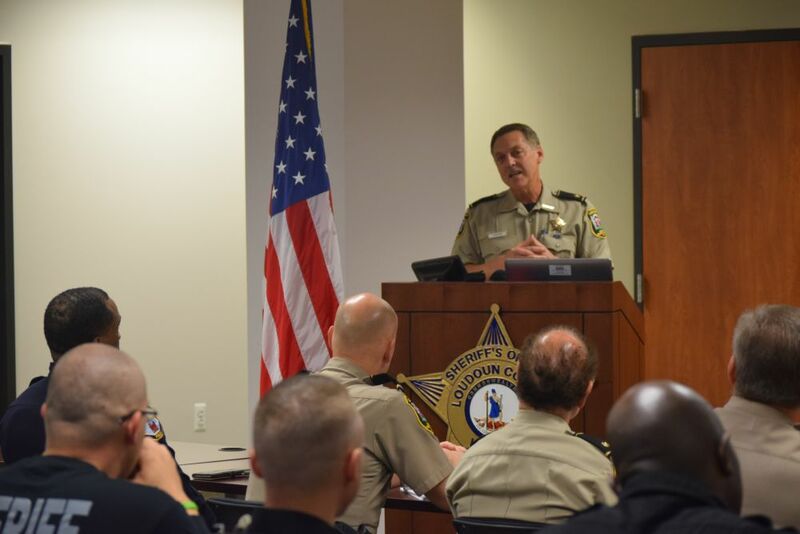 Herring and Loudoun Sheriff Mike Chapman spoke to deputies in a roll call room at the agency’s Leesburg headquarters. Leesburg Police Chief Gregory Brown and Purcellville Police Chief Cynthia McAlister and some of their officers also attended. Chapman is featured in the video. Since December 2015, his deputies have been trained to administer the overdose antidote Narcan. They’ve given the treatment 13 times. Last year, there were more than 1,400 fatal drug overdoses in Virginia. For the fourth consecutive year, more Virginians died from overdoses than from vehicle crashes. Loudoun reported 29 fatal opiate overdoses last year. Increasingly, investigators are finding heroin that has been mixed by street suppliers with the powerful painkiller fentanyl, and more recently carfentanyl—a synthetic opioid that is 10,000 times more powerful than morphine and is used to tranquilize large animals. In the hands of addicts, the mixture is frequently lethal. “What you’re seeing is a trend that is very scary here,” Chapman said. For Herring, the battle against opiate addiction has become a top priority. The subject was barely on the radar of state health and law enforcement leaders when he served in the Virginia Senate and then was elected attorney general in 2014. Today, he spends much of his time touring the state to raise awareness of the dangers and community challenges in play. Sunday afternoon, he visited the ADAMS Center mosque in Sterling for a showing of the documentary “Heroin: The Hardest Hit” and a discussion. Sheriff Mike Chapman talks about opiate overdoses during a Monday morning roll-call session with deputies at the agency’s Leesburg headquarters. Herring said that 84 Virginia law enforcement agencies have officers certified to administer Narcan. The new training video, “When Seconds Count: How Law Enforcement Can Save a Life during an Overdose,” is designed to help departments better understand the problem and to be in a better position to save a life when responding to overdose calls. The video will be distributed to every Virginia police department and sheriff’s office this week. “There is no such thing as a typical opioid addict,” Herring said, noting the epidemic abuse of painkillers and heroin crosses all age groups and income levels. Herring and Chapman said that continuing to raise awareness and improving treatment systems are critical in the public health battle. On the front lines, Loudoun Deputy First Class Eric Urbain said he sees the tide turning, at least a little bit. Last fall, he administered two doses of Narcan to successfully revive a Sterling woman who was barely breathing after a heroin overdose began shutting down her respiratory system. For him, Narcan is just another tool that helps deputies do their jobs—protecting the safety of the county’s residents. 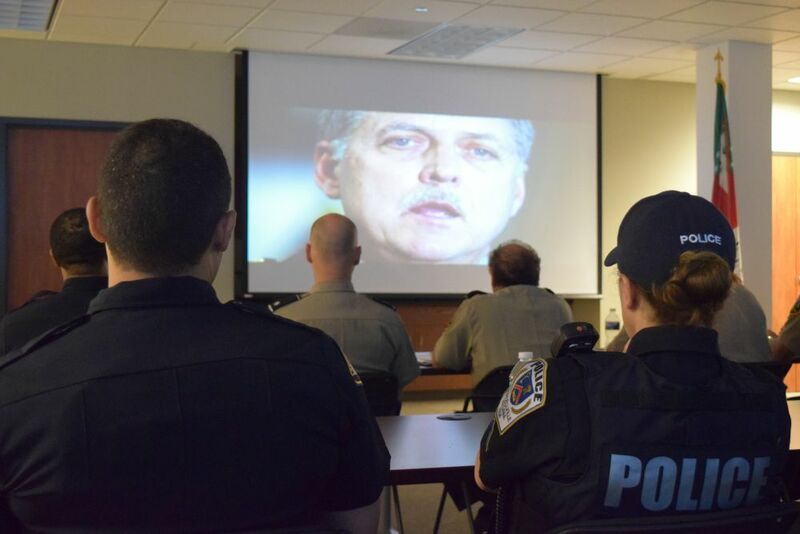 Loudoun deputies and officers from the Leesburg and Purcellville police departments watch Sheriff Mike Chapman on the big screen during Monday’s debut of a new training video being distributed by the Attorney General’s Office. Caption for Herring in the first picture.